from the Cape Town Waterfront. Licensed for 40 passengers. Operates in up to 50 knots of wind - the picture above shows 40+. Normal crewing complement of two! 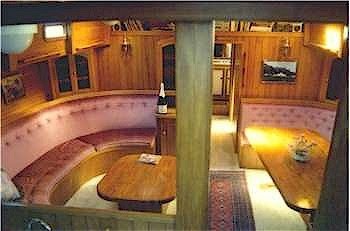 After taking a good look at these traditional (Dudley Dix) designs I sometimes wonder if the current design culture of "modern" cruising yachts has completely lost the plot! 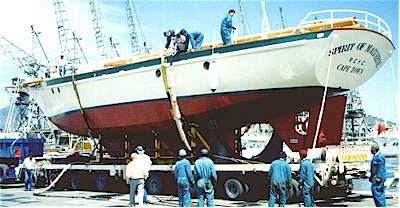 For me, it has been a startling revelation to find these traditional steel "low-tech" Hout Bay designs are actually superior to most modern designs of high-tech sloop-type cruising boats, in respect of practically all things that matter to cruisers... Their only compromise being nth-degree upwind performance, for course racing etc. Or to put it another way, the obsession with upwind performance has massively compromised the design of contemporary cruising boats in all but one area - that of upwind racing, which is of course the one exact thing that doesn't really matter to cruisers. Nearly everything that makes a sailboat expensive has to do with upwind racing. Be it the tall multi-spreader rigs, the winches, furling systems, carbon-fibre bits, deep bulb-keels, lightweight hulls and engines - these things serve limited or zero purpose off the wind! And worse than that, they actually compromise almost every aspect of a sailboats function when not actively beating - in which case a bulb keel is a drag, a low aspect rig is better, a longish keel for tracking and stability, light bendy masts not required etc etc. and now resident at Hout Bay Yacht Club. That's not to say simple traditional rigs don't sail well upwind - they really do these days as long as they have decent keels - which the old gaffers seldom did unfortunately. The Hout Bay's do have decent keels - they sail very well upwind. And now I will argue they do better at everything else that matters to cruisers, commercial workboats or charter boats, at a fraction of the price! The Hout Bays are all of robust steel construction. I have nothing against Ply and GRP - they have their merits - but when it comes to things that go bump in the night, tying up in fishing harbours, rafting for Panama, or the occasional grounding - steel has a definite advantage. Leave your boat in a foreign port for a few weeks while you have to go home or whatever, or on the hard during hurricane season - you sleep better with a steel boat for sure. The simple rigs, steel hull and generally low-tech nature make for easy maintenance that anyone can do anywhere. Everything comes from the hardware shop, not the boat shop. Given the Hout Bay 40 and 50 gaff rigs, I think they could be sourced entirely from the farmers co-op! Even the mast is a simple steel pole, with galvanised wire rigging.... Spectra, stainless steel, fancy winches not required. Homemade blocks are used and large wooden spars. Solid Steel poles for the masts, galvanised wire stays. Its all open and accessible and fixable. These traditional rigs do very well on all points of sail, and the low aspect gaffs really do well off the wind and while reaching. But these Hout Bay's have huge load carrying capacity - for example the Hout Bay 50 is rated for 10T of load! This makes it possible to install a large simple engine and a few tons of diesel. And we all know passage-making times are often determined by the fuel available. Never mind ghosting over the ITCZ with drifters etc when you have loads of fuel and a long-life engine. Consider also bringing a boat back from say the Caribbean to South Africa. Motor straight back through the ITCZ and the South Atlantic high in about 4 weeks, or sail down via Brazil and the Southern Ocean in double that time, in rough seas and cold? Rhetorical question for most. These are excellent long-range motor-sailers. Under sail alone, the Hout Bay 50 "Cape Rose", a Gaff Schooner, once covered 1200 miles in 6 days under sail, a very credible log for even a racing boat. This is a HB70 example interior. That champagne is a Magnum! Example interior of Cape Rose, an HB-50. great for access but also weight distribution. 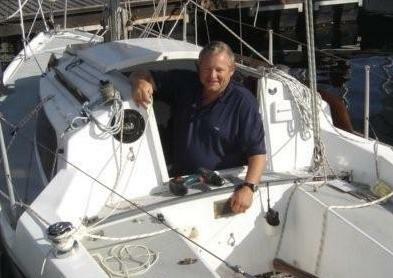 The generous rudders placed well aft allow good steering under sail and in marinas. The moderate (longish) keels make for excellent tracking and stability - in many cases self-steering isn't even required. I recall reading how one of them sailed straight without auto-pilot for about ten days returning from St Helena I think. The traditional rigs offer a relatively low centre of effort, and present far less rolling and broaching opportunities than a "tallmast" outfit sailing downwind. 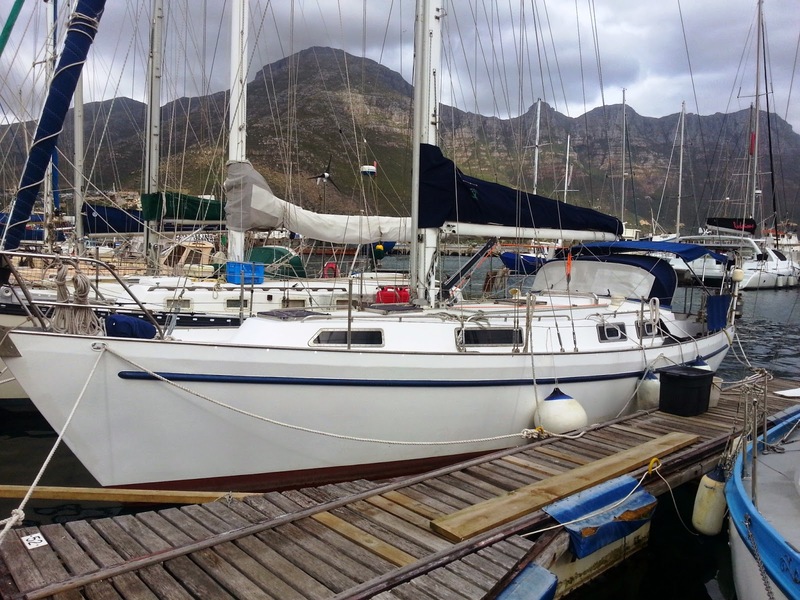 The "Spirit of Victoria" is a Hout Bay 50 operating from the Cape Town Waterfront. 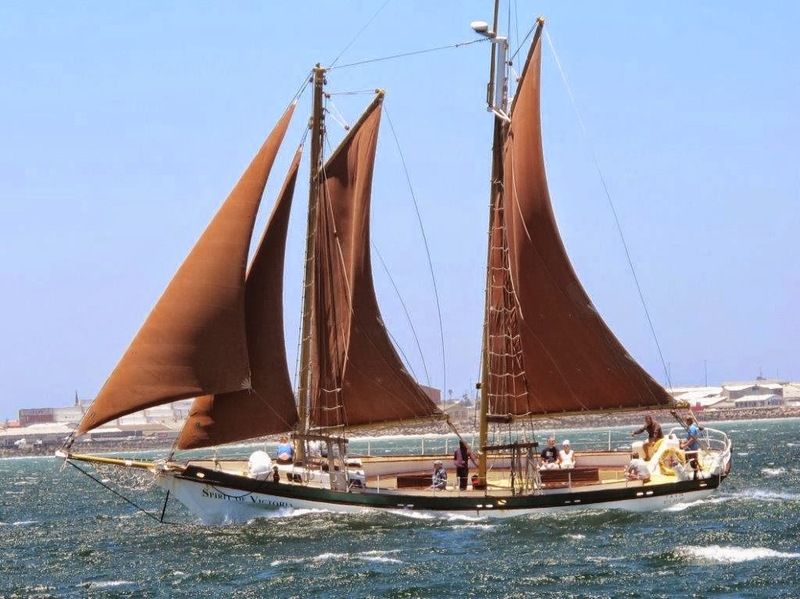 It is a Gaff Schooner, and is operated by just two crew, with up to 40 passengers, in winds up to 50 knots. The other rigs will be even easier. 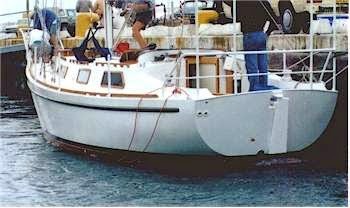 The Hout Bay 30 and 33 are fine looking boats with a classic and practical look about them. Understated and elegant, they look the business. This one is a nice plain simple sloop. Hout Bay 33 in Hout Bay! Very easy on the eye, it will go anywhere. Simple transom-hung rudder with tiller. The Hout Bay 40 and larger are spectacular and traditional, especially the Schooner options - either the Gaff or the Marconi Staysail Schooner. You can do the Chesapeake Classic Schooner race in one of these! For some reason I am beginning to prefer these to Sloops. One has to admit, the looks of a boat are really quite important to the whole sailing experience. Nothing worse than arriving in port with an ugly slab-sided boat - people think you're an aesthetically challenged squatter. Well maybe there is one thing worse - a fancy modern tupperware - in which case you come across as a poser from Wall Street or some such thing. But arrive in a Gaff-Ketch with traditional sails and people will buy you beer (maybe even rum), whilst admiring your senses of taste, traditionalism, wisdom and wonderful seamanship. Add a pipe and a beard and you will soon be fully booked for pirate parties. Bonus - no-one will know you have a brilliant motorboat hidden below all those ropes and climbing ladders! How can you beat this for sheer spirit? Beautiful Gaff Schooner for the HB 40 and up. 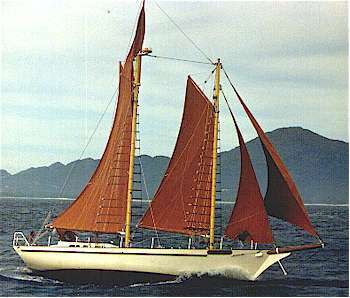 Marconi Staysail Schooner on the HB 40 and up. Various other rigs are available - including a Gaff cutter, and a Marconi Cutter, each with their own merits. Links are provided below to the detail specs of each design on Dudley's website. I have already mentioned these boats sail well, motor well and are practical for all sorts of options and places. 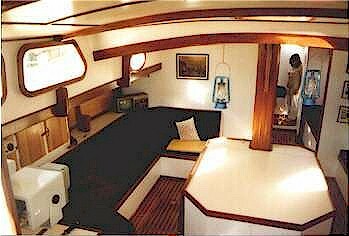 The gaff rig particularly appeals because the air-draft is quite low (Inland waterways), while the Hout Bay 40 offers the option of a shallow keel (1.3m) - European canals anyone? The gaff masts would be fairly easy to lower and stow on deck. And then of course you could go around the Horn or the North West passage too. So there you have it - a simple traditional boat that works better, looks better and is far cheaper than that cruise-adapted race boat you used to think was perfect. Or maybe that was me.... Anyway - there's a whole lot more to these great boats than meets the eye! One other thing - the Pratique 35 is really part of the same family.